My love for Kristen starting from forever and ending at never. I can’t sleep. I was sitting on the couch in the dark living room. I tried very hard to close my eyes, but I still can’t. It was almost 5 am. I looked at my tight schedule for November. From one interview to another, from one show to another, alone. Without Kristen. I felt a hollow in my lungs. I didn’t like the feelings. Though I would be with her during our visit to Tokyo and Paris, but I still don’t think it would be enough. Well, Paris is promising, but I still can’t close my eyes. Kristen is still sleeping. I stood up, walked slowly to our room, took a peek to see her. I was still wondering, how I could enjoy my new habit. Seeing her sleeping. Exactly just like Edward loves to see Bella in her sleep. She’s very beautiful. Her creamy skin glowed under the tender lights. My angel, my love. I went closer to our bed, bent my self to give her a light kiss on her forehead. Then I moved back. I shut the door slowly, back to my couch. Sitting. Thinking about another annoying thing. My last conversation with Jackson. We were out together with Kellan. Jackson decided to stay a bit longer after Kellan left. He told me about his feelings. He was a little bit sad because he could not go further on his relationship with Ashley, but he already got it over and actually he was happy too because I was luckier with Kristen. “You just getting closer and better with Kristen each time I met you Rob”, he said. I was just smiling. Then he asked me one question that strokes my nerves. “Do you really think you can keep your relationship with her after the whole saga end, Rob?”. It was not usual. Usually Jackson was the one who hold his words. I raised my eyebrows, “what’s all about Jacks, what kind of question is that?”. He stared at me, quite a moment, exhaled, “I wonder Rob. What exactly the reason of the closeness. Do you really attracted then fell for her because you really find something different in her or your role as Edward influenced you very deep till you can’t separate your real feeling anymore?”. “No need to answer me now, I gotta go. My only wish, be really sure about your feelings for Kristen. Don’t let any false feelings jeopardize your role , we’re having Breaking Dawn on our path”. He stood up, said goodbye and left, leaving me alone with his question. She yawned, “Yes, I saw it. What about it? It didn’t bother me at all Rob. It was not true, just as before”. “I never thought about that either before, love. But, have you ever think about the reasons you’re here with me?”. She pulled herself from mine. “What’s wrong Rob? What are you saying here?” I took a deep breath, “Why do you love me, Kristen?” She looked a bit surprised with my question. “What’s wrong, Rob? Why are you asking this question? Is Jackson has something to do with your question?” I nodded my head. “He was wondering my reasons about my feelings for you. Do I love you because I love you, or do I love you because I could not separate my real feeling from Edward’s”. She pulled herself, fully opened her eyes. “You remember last month Rob, I asked you about your love. Do you love me because I am beautiful, or am I beautiful because you love me? None of us answered the question, but I was very sure that I am beautiful because you love me not the other way around”. I remembered that day. I remembered it very well. We were on photo shoot for a magazine. If I ever said that she’s beautiful, I was wrong, because on that day, she’s more than just beautiful. She was gorgeous. I think because I love her, I could see her better than any other people. I see her with my heart, not with my eyes. I remembered my ear to ear smile, expressing my feelings. It was so easy to pose under the instructions. So when she asked me that question, during the breaks, I didn’t feel like answering. My eyes and my heart were over excited. I expressed my reaction by hugging her tightly, thanking her for her compliment. I could remember how satisfied I was, because my love for her made her beautiful. I sensed her hand on the locks of my hair, bring me back to our conversation “Now that question goes to another one for you Rob, do you love me because I am Kristen, or do you love me because you see me as Bella?” “What will be your answer Rob?” I took her right hand, brought it to my chest, “You know Kristen, the very reason I decided to go for Twilight audition was because you would be the leading role. I was crazy delightful when Catherine decided, well, after you, my sweet angel, gave your little pressure to her, to gave me the role as Edward. I never imagined that my feeling would grow bigger for you. I fell quite hard over you, Kristen. I believe my growing feeling was the ultimate reason for acting normal as Edward. It was very easy to act as brooding vampire who would do anything for his love, because as me, that was what I felt. I would do anything to have you”. “When time passed by, I frequently asked myself the same question, do I love you because of me or because Edward’s character took my feelings too deep. But you know, I’ve been waiting for quite long before you decided to trust me and took me as the love of your life. At this moment, I am sure I love you as Kristen not as Bella”. I took her face, planted my kiss to her soft lips, after a few moments, I pulled my lips from her, “I would ask you another question too, if you love me as Kristen, would you love me like Bella loves Edward?” “Would your feeling for me last forever?” She smiled, caressed my cheek slowly with her index fingers down to my chin, my neck, my chest, opened her other finger and put the warm palm there, “Do you really think you can love me like Edward loves Bella, Rob?” I was silent for a moment. I set my eyes to hers, “I am not Edward, love. I can’t live forever, but my heart knows, my love for you is a journey. It starting from forever and ending at never. Would it be enough for you?” She didn’t answer. She just bent her body, put her cheek onto my chest. “Somebody wants you, needs you, dreams about you every single night, I can’t breathe. Do you know what lonely is Rob? It’s my life without you”. I hugged her. The sun started to raise, a new day, a new commitment for our relationship. Tokyo was great, as usual. I love the fans, but Paris was something else. The ambient gave different experience, probably because I was in Paris, the most romantic city in the world not only with my friend, but I was in Paris with Kristen, the love of my life. I smiled every time Kristen stood near me. It was very easy to face the crowds. Just thinking about our last conversation, then I will widely smile. Days passed very quick. We were heading back. I still walked on the clouds, very happy with Paris. 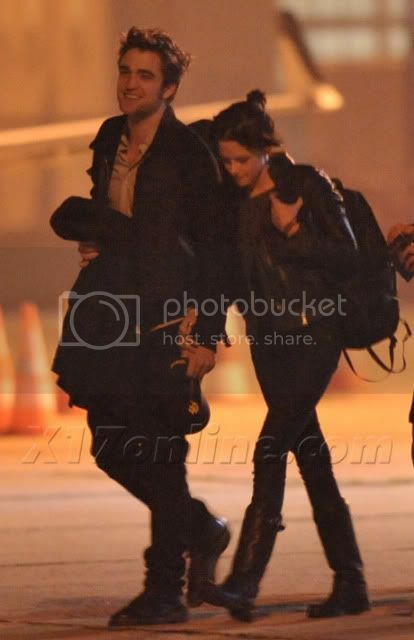 Kristen was walking with me to our private jet. Suddenly, I felt her hands on mine. I didn’t say anything, but my smile was getting wider. Kristen never did that simple yet intimate gesture if we were not in our private sanctuary. But she did it now. We are ready to tell the world, we are lovers. I have my answer for Jackson, I will tell him when I meet him. My love for Kristen is because she’s Kristen not because she’s Bella. I am not Edward, but I can love her like Edward loves Bella. It won’t be necessary anymore to hide our relationship. Kristen is every reason, every hope and every dream I’ve ever had. No matter what happens in the future, every day we were together was the greatest day of my life. These are what I had in mind when I looked at the pictures. My writings is just my point of view, my own analysis. This entry was posted in Imaginary Writings, The Couple, Robert & Kristen by toebildonk. Bookmark the permalink. ome… thats so romantic i wish i waz inlove like kristen!!! but the story seems more like twilight not real life,but i guess its cuz all the pics in the magazines showing kristen holding hands with other guys & rob flirting with other girls!! !they should make it more believable,not just telling a story online about ur true relationship!! !we wont to see pictures,right!! !but i wish u guys the best!! !i know that u will be together forever if any of that was true!! !i hope it was!! !u 2 belong together!! !so make it last & make us believe the story!! !again i wish u 2 the best!!!! !